Should there be rain and adverse conditions, we are encouraging passenger cars to make use of the shuttle service from the Knysna High School sports fields on Trotter Street. 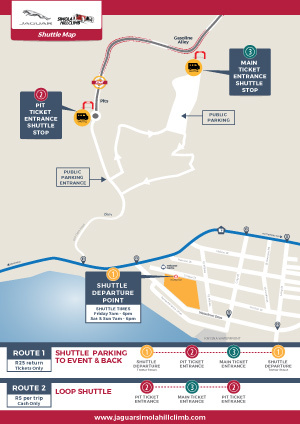 The shuttles will run directly to the Main Public Ticket Entrance and the Pit Ticket Entrance gates. The cost is R25 return per person. You can pay cash or tickets can be purchased online in advance. Two drop-off points are available – either at the main entrance near the pit complex (Pit Entrance Ticket Gate), or at the bridge over the track above Turn 3 that provides access to Gasoline Alley and the spectator areas (Main Public Ticket Gate). There will also be a hop-on hop-off shuttle from the Pit Ticket Entrance to the Main Public Ticket entrance, and back again to a drop off point close to the pit entrance. A R5 charge will be levied per trip payable to the driver. Public parking is available adjacent to the Gasoline Alley entrance, with access best suited to 4x4s and vehicles with high ground clearance.